A library must be useful but it ought to have a sense of humor as well. We want people to be happy to see us. That goes for our online presence, too. This has nothing to do with libraries, mind you, but I’d love to see a library website fall apart like this retailer’s website in the Netherlands. 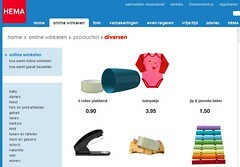 Kudos to Hema [here is their normal website] for letting customers in on a little fun. Over the years I’ve done a lot of goofy things on our intranet (mirror-imaged the home page, turned the “staff”web into a disease-ridden “staph”web, etc.) but we’ve been pretty tame on the public side. Has your library website had fun? This entry was posted on Friday, February 29th, 2008 at 8:56 am and is filed under fun, websites. You can follow any responses to this entry through the RSS 2.0 feed. You can leave a response, or trackback from your own site.